(Nanowerk News) A moth's eye and lotus leaf were the inspirations for an antireflective water-repelling, or superhydrophobic, glass coating that holds significant potential for solar panels, lenses, detectors, windows, weapons systems and many other products. The discovery by researchers at the Department of Energy's Oak Ridge National Laboratory, detailed in a paper published in the Journal of Materials Chemistry C ("Monolithic Graded-Refractive-Index Glass-based Antireflective Coatings: Broadband/Omnidirectional Light Harvesting and Self-Cleaning Characteristics"), is based on a mechanically robust nanostructured layer of porous glass film. The coating can be customized to be superhydrophobic, fog-resistant and antireflective. "While lotus leaves repel water and self-clean when it rains, a moth's eyes are antireflective because of naturally covered tapered nanostructures where the refractive index gradually increases as light travels to the moth's cornea," said Tolga Aytug, lead author of the paper and a member of ORNL's Materials Chemistry Group. "Combined, these features provide truly game-changing ability to design coatings for specific properties and performance." To be superhydrophobic, a surface must achieve a water droplet contact angle exceeding 150 degrees. ORNL's coating has a contact angle of between 155 and 165 degrees, so water literally bounces off, carrying away dust and dirt. This property combined with the suppression of light reflection from a glass surface is critical for improved performance in numerous optical applications, Aytug said. The base material--a special type of glass coating--is also highly durable, which sets it apart from competing technologies, according to Aytug, who described the process. "We developed a method that starts with depositing a thin layer of glass material on a glass surface followed by thermal processing and selective material removal by etching," he said. "This produces a surface consisting of a porous three-dimensional network of high-silica content glass that resembles microscopic coral." The fact the coating can be fabricated through industry standard techniques makes it easy and inexpensive to scale up and apply to a wide variety of glass platforms. "The unique three-dimensionality interconnected nanoporous nature of our coatings significantly suppresses Fresnel light reflections from glass surfaces, providing enhanced transmission over a wide range of wavelengths and angles," Aytug said. The Fresnel effect describes the amount of light that is reflected versus the amount transmitted. Where solar panels are concerned, the suppression of reflected light translates into a 3-6 percent relative increase in light-to-electricity conversion efficiency and power output of the cells. 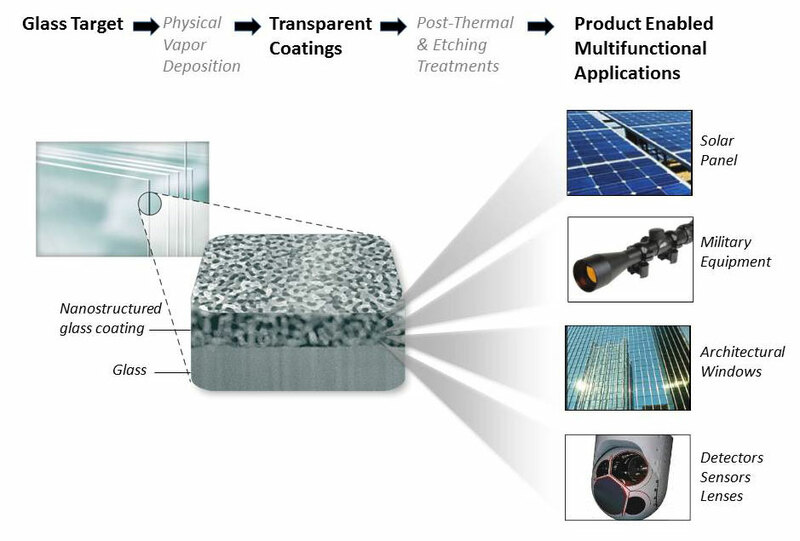 Coupled with the superhydrophobic self-cleaning ability, this could also substantially reduce maintenance and operating costs of solar panels. In addition, the coating is highly effective at blocking ultraviolet light. Other potential applications include goggles, periscopes, optical instruments, photodetectors and sensors. In addition, the superhydrophobic property can be effective at preventing ice and snow buildup on optical elements and can impede biofouling in marine applications. Aytug emphasized that the impact abrasion resistance of the coating completes the package, making it suitable for untold applications. "This quality differentiates it from traditional polymeric and powder-based counterparts, which are generally mechanically fragile," Aytug said. "We have shown that our nanostructure glass coatings exhibit superior mechanical resistance to impact abrasion - like sand storms - and are thermally stable to temperatures approaching 500 degrees Celsius."